So there you have it. It is $149.99 with a pack in game. Packing in Kinect Adventures instead of a Wii rip off sports game is a good thing. I still think it's 50 dollars too much. Microsoft said previously that they are trying to make a serious push, but without competitive pricing, I don't think it will succeed. This chart favors the 360. The 360 system is the 4gb model, a joke to any real gamer. So you actually need to factor the price of an actual hard drive, which adds a $100 to the cost. 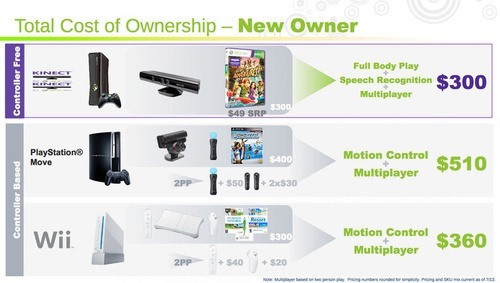 It's accurate on the PS3 costs but on the Wii, the balance board is optional so the overall price can be less. The 360 does not mention that multi player is not really included because that service is $50 a year. The chart above is a little bit more balanced. 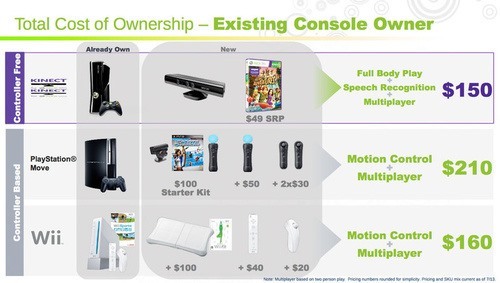 The only thing I would change is the Wii balance board, except for a few games it's not really needed. The only argument one can give for the inclusion of the balance board is that if you want to play a fitness game like on the 360 and PS3, you need that balance board on the Wii. 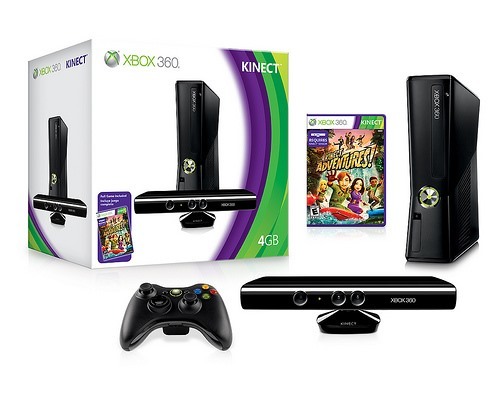 360 Kinect will be released on November 4 and PS3 Move on September 19, giving the PS3 an early head start. I don't know if Sony is demoing their Move controllers, but you can preview Kinect at the Microsoft stores or at Macy's, depending on the tour dates.